Remember that Kalavinka x Adidas Samba that everyone seemed to hate on? Well, maybe not everyone. Hell, I liked them, but that’s besides the point. 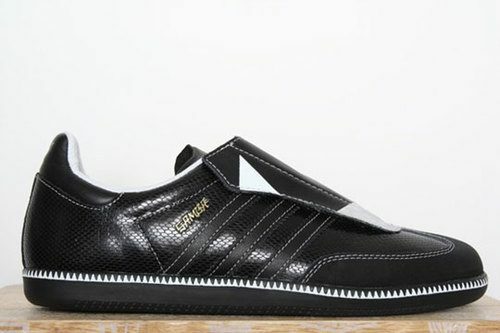 Adidas remodeled their Samba for fixed gear riding and even though Highsnobiety doesn’t mention that in their post, the designers at the Adidas tent told me these Madsaki shoes are part of a larger fixed gear pack that’s due out any day now. 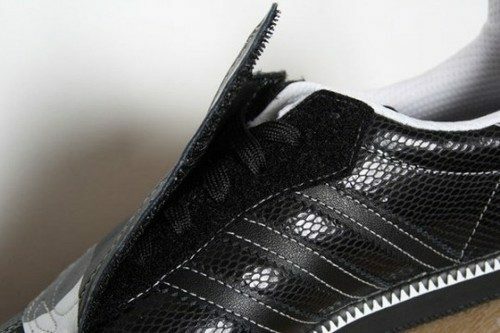 Some improvements made to the shoe were a stiffer sole, extra padding at the toe box and a Velcro lace cover to reduce lace wear. They had Kalavinka design one pair and Madsaki design another. To go with each shoe are a series of cut and sew items as well. I took some pics, but Flickr seems to be down at the moment. Everything I saw at the Adidas tent looked legit though, so you’ll have to take my word on it! No word on US-distro, although they did tell me these will be available in the States. Keep watch here for future posts as events warrant.